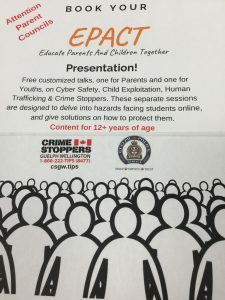 Join us at Ross on April 24 from 6pm to 9pm for an EPACT Presentation. No registration necessary. Ross Royal Graduates Inducted into Hall of Fame! Ross is hosting a Creative Media Contest that will allow students to showcase their creativity and skills related to visual storytelling. Entries can be in one of two categories: Video or Animation. Winners can earn cash and prizes! There will be an information session on April 3, 2019 at 12:00 in Room 203. Bring your lunch and a friend to find out more. Remember, there is a Live Free award for the most online donations!…..which we won the last two years…….. Here is the link, please remember to go to drop down list so that all money comes back to Ross!! In a safe, respectful, and socially conscious environment, John F. Ross C.V.I. will inspire students to be engaged learners who understand other people and perspectives within a changing local and global community. Students will be challenged to become creative and analytical thinkers, effective communicators, and healthy individuals who achieve excellence within and beyond the classroom. John F. Ross . Part of Upper Grand District School Board. All rights reserved.